Visiting in autumn, the most surprising aspect for me, was the sheer majesty of the Northern Lights displays. I had witnessed them during the winter, but as the Aurora appeared over Lake Menesjärvi, reflecting in the tranquil waters and highlighting the various shades of the Finnish ‘Ruska’, I was instantly spellbound. I recommend Menesjärvi simply for the possibility of witnessing this. Menesjärvi, Finland is a wild and remote location in the very heart of the Aurora Zone. During this 4-night trip, you’ll have the chance to witness the spectacular contrast between the Northern Lights and the ethereal shades of autumn, and learn how to capture it all during an Aurora photography workshop. 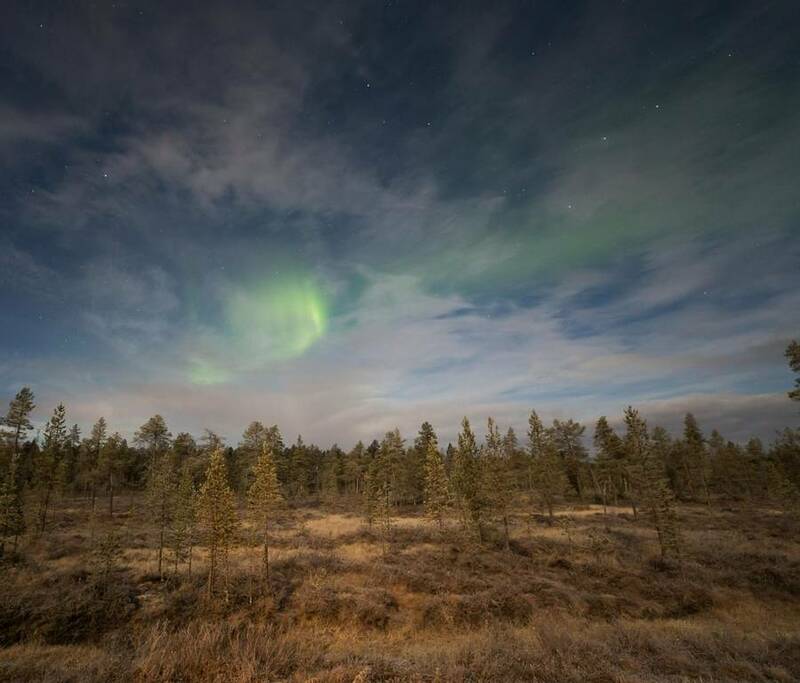 Perhaps the focal point of any trip to Menesjärvi is the anticipation of seeking out the Northern Lights. The Finnish ‘Ruska’ season sees the onset of darker nights and starry skies and the remote location ensures minimal light pollution. The landscape is bathed in the vibrant shades of brown and orange and it is a time of immense change in Lapland. September, in particular, showcases this contrast in colour and is an ideal time to visit. This holiday is designed to give guests an authentic Lappish experience during ‘Ruska’, whilst maximising the opportunities to explore the vibrant autumn landscapes and potentially witness the Aurora Borealis. 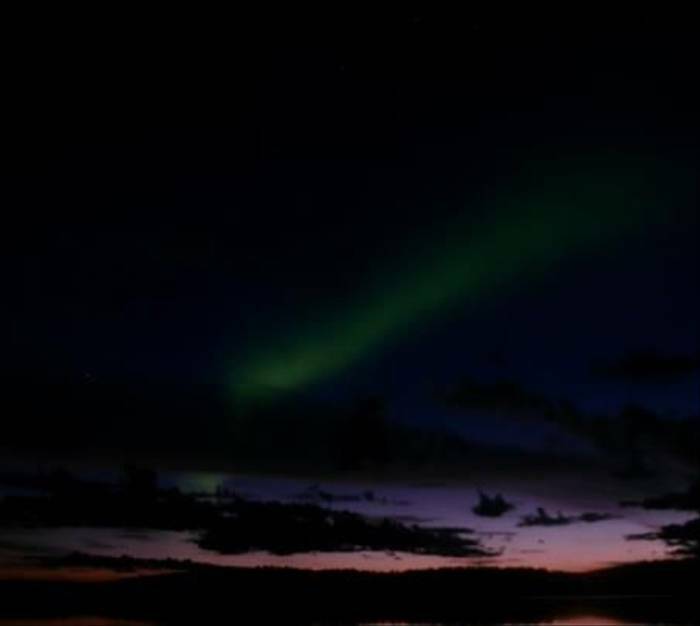 Auroral displays during the Finnish ‘Ruska’ can rival, and very often better, those of winter, due to the stunning colours and the captivating reflection as it dances above the still open waters of Lake Menesjärvi. Imagine the anticipation of seeking out the Aurora Borealis. The hunt is an experience in itself, but to witness the Northern Lights as they light up the autumnal skies is beyond description. Fortunately, an Aurora photography workshop will prepare you for any photo opportunities and introduce you to capturing this natural phenomenon. This Aurora Borealis holiday also includes a journey into the unusual Sámi culture. A visit to a local reindeer farm will give you a valuable insight into the lifestyle of the local Sámi herders. The Sámi have survived in the harsh Arctic environment for centuries and it is fascinating to learn about how important the reindeer are to that survival. You will also visit a local husky farm where your arrival will undoubtedly be met by a volley of excited barks, yelps, whimpers, growls and other assorted doggy noises. 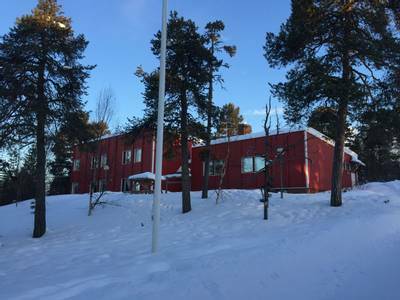 Following a tour of the husky farm, you will then visit the highly recommended Sámi Siida Museum, which showcases this unusual culture with an array of impressive displays. The museum also has a surprisingly colourful (the Sami people love bright colours) and attention-grabbing gift shop, where you can purchase traditional Sámi handicrafts. 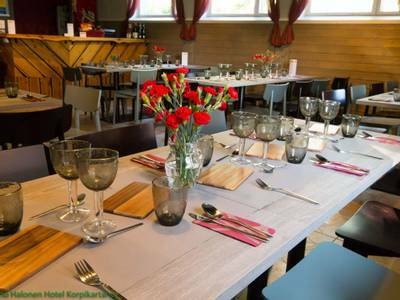 During your time in Menesjärvi, you will be based at Hotel Korpikartano which was a former boarding school and exudes character and charm. Your welcoming hosts Anne and Timo and the rustic simplicity of the accommodation offer the perfect introduction to Lappish hospitality. Its isolated location on the shore of Lake Menesjarvi (jarvi is Finnish for lake) with virtually no light pollution and unobstructed views of the night sky is perfect for Aurora hunting. To conclude, this holiday has a striking balance of Lappish culture, autumnal nature and alluring Northern Lights hunting which is guaranteed to produce treasured memories. 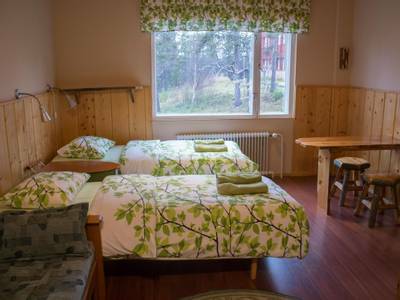 You will be met upon arrival and transferred to your rustic accommodation which exudes Lappish charm and hospitality. You will enjoy a home-cooked meal consisting of delicious local produce before you settle down for the evening. To awaken in a pristine wilderness such as Menesjärvi for the first time is an experience in itself. You will instantly notice the freshness of the air and will be filled with an eagerness to explore. The hotel looks out towards the lake and beyond this is a remote and picturesque landscape of forest and gently rolling fells. The Finnish ‘Ruska’ is a time of spectacular change and the vibrant autumn colours of September are a particular highlight. 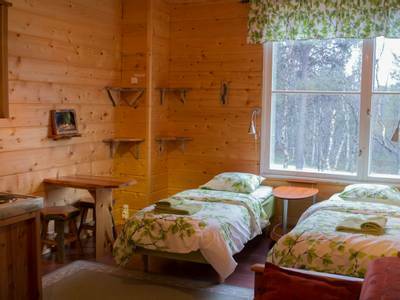 After breakfast, you will begin your exploration with a visit to a nearby reindeer farm. Reindeer herding has long been an important part of the centuries-old Sámi culture and the reindeer itself has become a symbol of this region. It is an animal which is synonymous with these arctic landscapes and meeting the herders provides a first-hand insight into this unusual way of life. The farm is located a short distance from the hotel and on arrival, you will be welcomed by a local herder. During a tour of the farm, you will gain insight into this fascinating age-old culture. To understand how the local people have thrived in this remote corner of the world is truly remarkable. Following the tour, you will return to your hotel for lunch before enjoying an afternoon at your leisure. 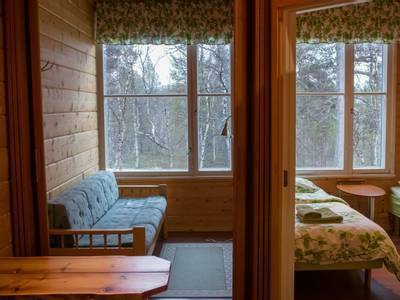 There are a number of marked walking trails close to the hotel or you may wish to enjoy a traditional Finnish sauna, which is a must do for anyone visiting Finnish Lapland. 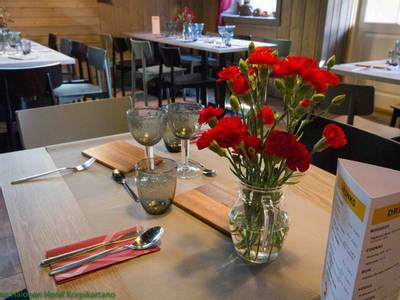 A home-cooked dinner will be served in the restaurant during the evening before your first Aurora hunt. Prior to your nocturnal excursion, you will participate in an Aurora photography workshop. This is vital if you want to learn the skills required to capture the lights on camera and will prepare you for any sightings. Following the workshop, you will begin to feel the anticipation and excitement mount, as you venture into the wilderness either by car or on foot. Your knowledgeable guide will use their experience to determine the best possible viewing spot. The location of the hotel means that you may not have to venture far to witness a display. The lights reflecting on Lake Menesjärvi is what an autumn Aurora hunting holiday is all about. On a really good night, you can get two Auroras for the price of one as the dancing lights are reflected in the inky black waters of the lake. The contrast of light and colour can rival, if not better, those of winter and what’s more, you rarely have to cope with sub-zero temperatures either. Following breakfast, you can enjoy the morning at your leisure. A sauna is a fantastic way to start the day and will leave you feeling revitalised for the upcoming activities. 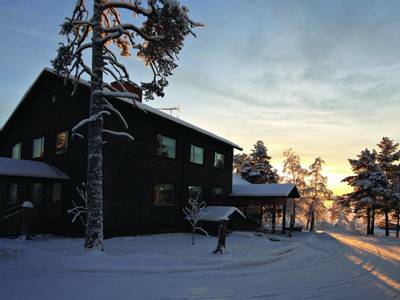 At around midday, you will venture to a traditional Lappish Kota and enjoy lunch cooked over an open fire. A deliciously cooked starter of reindeer sausage is bound to entice the taste buds, before a homely bowl of hot soup and a homemade pastry. After lunch, you will enter the nearby forest, enjoying the electric colours and fragrant autumn aromas. The Finnish Ruska can see the first smatterings of snow, so it is not uncommon to witness the first coverings which signal the oncoming winter. As you peruse the forest, keep an eye out for wildlife and an interesting array of birds. Your knowledgeable guide will point out any animal tracks and will provide insightful information on the surrounding environment, including the autumn flora. September can see the growth of delicious seasonal berries and mushrooms and you can forage for something to include in your evening meal. As darkness falls you will have another opportunity to seek out the Aurora Borealis. Similarly, to the night before, your expert guide will make a decision as to whether you go on foot or by car. The remote location means that you don’t often have to travel far to escape artificial light and the car offers the possibility of outrunning any cloud cover. Chasing the Aurora and experiencing that sense of anticipation that it may appear at any moment is a thrilling concept. To then witness a spectacular display, as the night sky blazes with dancing colour is mind-blowing and very difficult to put into words. No trip to Lapland is complete without a visit to a husky farm. These excitable dogs are eager for visitors and will welcome you with a frenzy of collective barking. 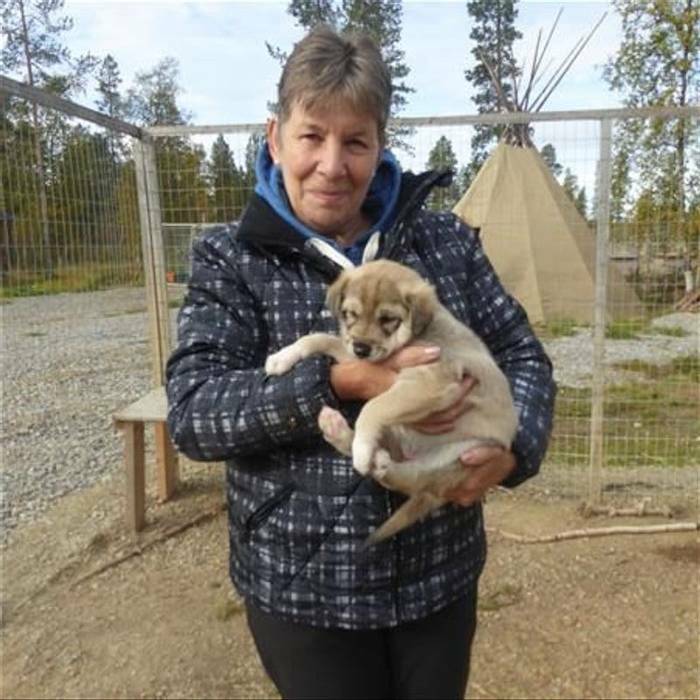 The host will give you a tour of the farm and an insight into the role of huskies north of the Arctic Circle. You will then get to meet the dogs themselves. If you are lucky you may also get to cuddle some puppies. Following your visit to the husky farm, you will then travel to Inari which is the centre of Sámi culture in Finland. The colourful and insightful Siida museum has a fantastic collection of exhibitions, including an outstanding Northern Lights gallery. To thrive north of the Arctic Circle is no easy feat but the Sámi have done so by understanding and respecting the land. 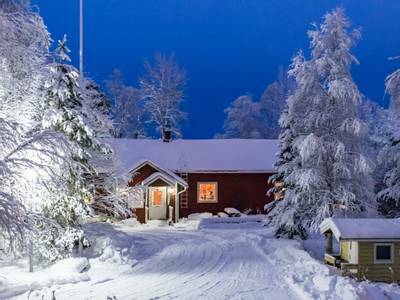 An example of this understanding is reflected in the Sámi language, which has around 180 words for snow. Impressive, gigantic photographs tell the colourful story of the Sámi people and how they have adapted to the Arctic conditions. The remainder of your day will be yours to spend as you wish. 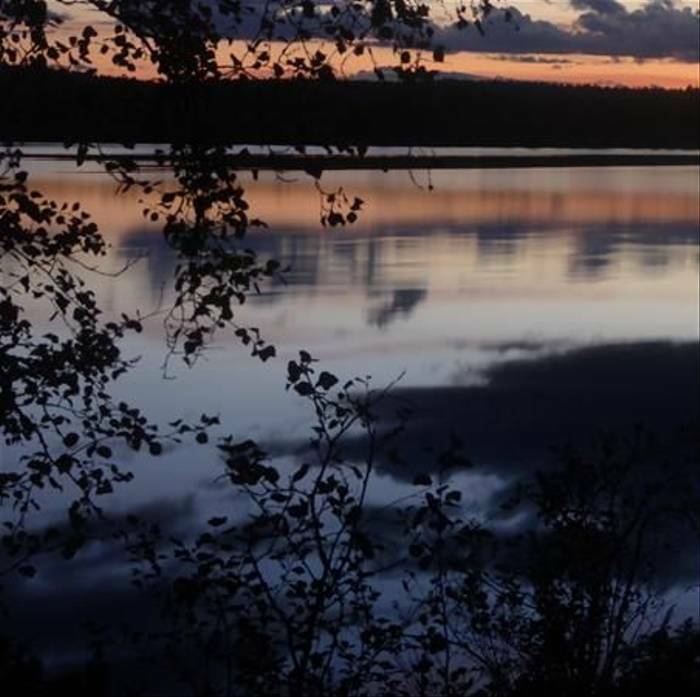 You may want to unravel further the mysteries that lie within the forest or admire the views over Lake Menesjärvi. As darkness falls, we would highly recommend taking a final opportunity to seek out the Aurora. Your hosts will be more than happy to assist you, should you wish to follow any of the marked trails, but the wilderness location means that the Aurora can very often be spotted from just outside the hotel. Enjoy the picturesque surroundings one last time before embarking on your journey home. Following breakfast, you will be transferred back to the airport with a wealth of life lasting memories from this Finnish ‘Ruska’ experience. 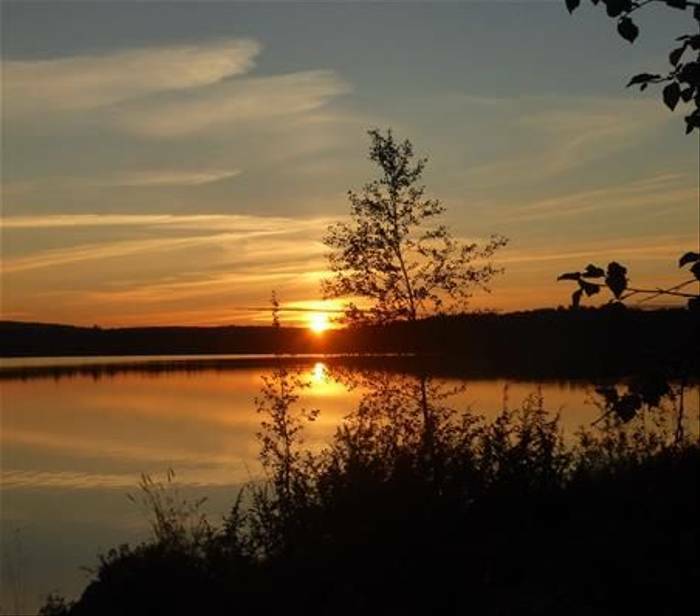 Alternatively, if you would like to extend your stay in Menesjärvi, then please contact one of our Travel Experts. 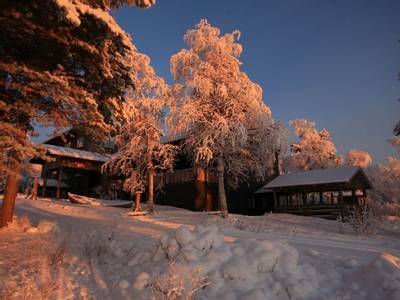 Hotel Korpikartano is a very special place in a breath-taking location in Finnish Lapland. Its situation could not be more idyllic, with a fantastic outlook over Lake Menesjärvi and the remote wilderness beyond. 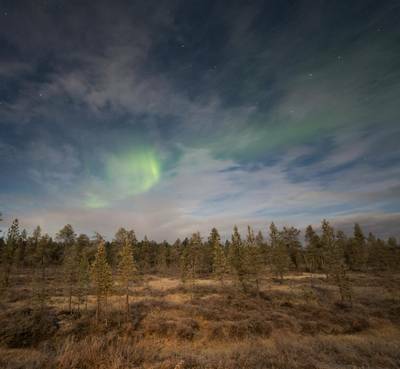 The lack of artificial light in the area ensures that if the Aurora appears, then you can enjoy amazing displays from very close to the hotel. Hotel Korpikartano was originally a boarding school for those growing up in this remote part of the world and is, therefore, full of quirks, character and charm. The welcome provided by the owners, Anne and Timo (Timo is retired but still makes regular appearances to take Aurora photos here), creates a wonderful atmosphere and their passion for the region is infectious. The staff and guides have a huge passion for this landscape and for providing guests with a truly memorable stay. The hotel comprises of two main buildings. The first houses the dining room and a number of bedrooms. A separate annexe building (a very short walk away) houses the majority of the guest accommodation. It is a place with great soul and which offers guests the chance to completely switch off from the everyday and relax in a wild and beautiful environment. You are likely to leave feeling very privileged to have experienced this wonderful place. Traditional home cooking is the order of the day in the hotel’s dining room. The food can be described as 'simple, tasty and hearty' and is very much designed to fuel you up for your outdoor adventures. In many cases, the evening’s set menu will contain local ingredients such as fresh fish that Timo has caught, berries Anne has foraged, or meat purchased from the local reindeer herders. The set meals are all self-service. Breakfast is a buffet of breads, meat, cheese and fish with the addition of porridge and fruit. Lunch and evening meals start with a salad and bread, a set main and then a pudding which is often a local speciality. Please let us know at the time of booking if you have any dietary requirements so these can be accommodated. You can also purchase a range of wine, beer and spirits to accompany your meal. Obviously, saunas are a pre-requisite in these parts and there are two, one in each building. They can each be booked privately by guests each day in hour long slots. There is an outdoor wood-burning sauna and rustic hot tub. 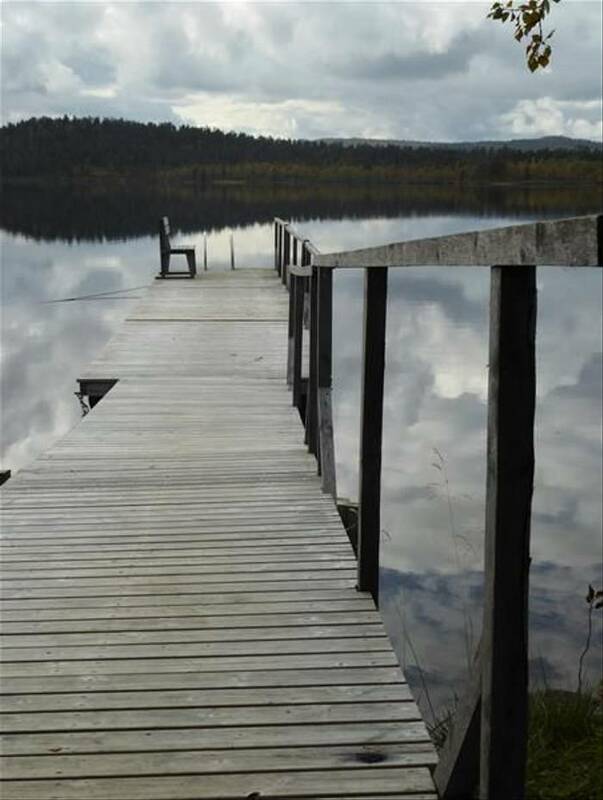 Should you request the use of the outdoor sauna (a local charge will apply), don't forget that a dip in the lake (in autumn) or a roll in the snow (in winter) is almost obligatory (as long as you are in a good physical condition). The simple lounge (near the reception) provides tea and coffee making facilities. Consider this to be the perfect spot to relax by the stove with a book but remember to keep your eyes peeled for the Northern Lights as the windows face north! There is free Wi-Fi for guests to use throughout both buildings and there is a PC available at reception. Books and games are also available to borrow from reception. If you are travelling in the winter then the hotel offers free use of snowshoes, cross-country skis, kick sleds and toboggans so there is also something for those who love the great outdoors and want to explore independently between activities. There are marked trails across the stunning frozen lake and maps are available at reception. If you want to send a memento home, then there are postcards available to purchase and some of Timo’s Aurora photography is for sale. Anne also knits cosy woollen socks for charity and these can usually be purchased at reception. There is a lakeside Kota (wooden tepee) which is open for all guests during the evening. 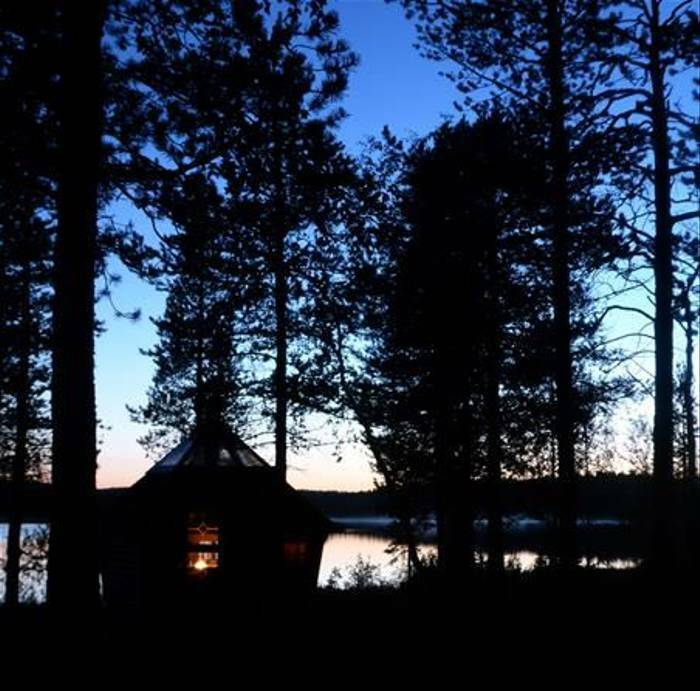 Here you can light a fire and warm up in between forays out onto the lake in search of the Northern Lights. The 28 guest bedrooms vary in size and shape as you may expect from a former school. 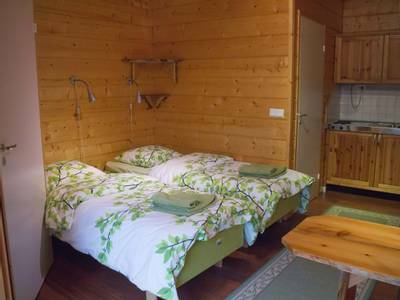 They are cosy, comfortable and decorated with locally-sourced wood. Some of the furnishings have been crafted by Timo's own hand. All guest bedrooms have an en-suite bathroom with shower and a hairdryer. Cups and kettles are provided in each bedroom and a variety of teas and coffee is available in each building for you to take to your room. Read more simply astounding and the help from Matty with my camera really got the most out of my experience. But the cultural and natural history excursions just added to the enjoyment. The day we travelled home was my wife's birthday. The surprise and delight for her to be presented with a bottle of bubbly on our last night is beyond description. Thank you so much The Aurora Zone. Read more Korpikartano, bright blue skies during the day and inky-black clouds seeming to hang heavily in the darkening sky. This is a wonderful location to really feel and understand the people who live and work here, and of course, it is an amazing place to stay, even for just four nights. Brilliant photo-opportunities of course, from the jetty leading out into the lake that looks unreal with reflected clouds, to the orange glow of sunset, and the amazing Northern Lights that surprise you with their shifting green shapes. This is a fantastic trip, a beautiful place to experience, plus the extra opportunities to see reindeer and husky dogs. Even though it is not freezing at this time of year, it is very cold standing outside until midnight with your camera, so you do need the warm gear. I only have a digital camera and although it is a good one, it is clear that your photographs will be much better with the one you can change to finer settings. 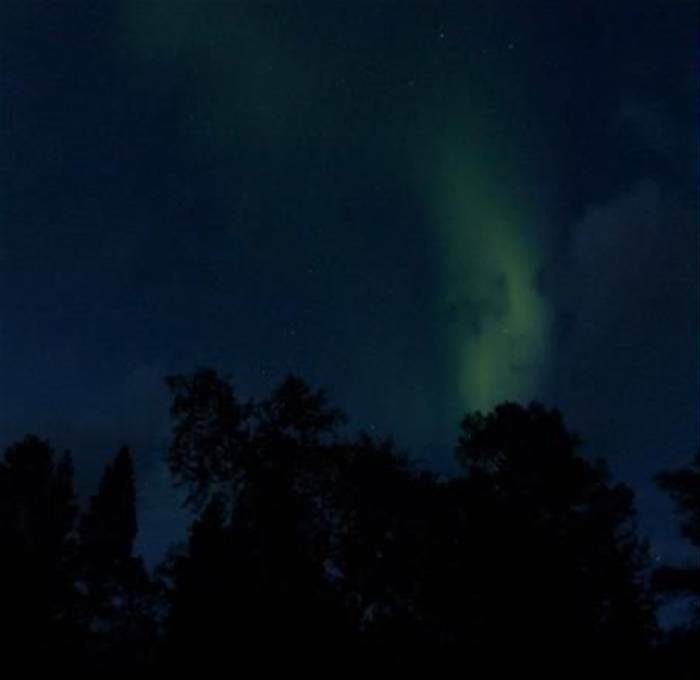 But, I saw the Northern Lights and although the photographs are not brilliant, the experience was! Definitely recommended. I could not have had better hosts. The hotel was wonderful. Matias was superb as a guide. He really made the stay. The food was the best I had in Europe. We enjoyed all of it! The nature walk, lunch and pancakes cooked outdoors, reindeer farm, Sámi cultural museum - and of course the Aurora.